Sometimes people ask me why I don’t share more of my daily life/funny posts on my blog like I do my personal Facebook page. The answer is kind of hard for me to explain. On one hand, I feel like my blog would reach a larger audience if I posted funny things or recorded funny vlogs, but at the same time, that’s not my passion. I would LOVE to be a fashion blogger, or just a viral “mommy blogger”. I would love for people to giggle at my one liners or line up for my opinion on Tide’s newest product, but that’s not where my heart is. When I started my blog, I had no idea what I was doing (obviously), and though much of that still holds true, I do feel like my actual writing and content has improved immensely. Many people that read my blog do request to be my Facebook friend (and I always accept), but what I post about on there is slightly different that what I write about in my blog. It’s nothing inappropriate or jaw dropping, it’s just different. The things I post about on my daily Facebook page are often related to my children, much like my blog is, but it shows a different side of parenthood. You see, when I was struggling with postpartum OCD, I would have never joked about the everyday struggles of being a mom. When I was scared to be near my kids, my inability to get any privacy from them would not have made me laugh. When I would hear stories of child abuse, I felt like I was so much worse than those people, purely because of my thoughts. I wouldn’t have joked about hiding from my kids in the pantry or going on “vacation” at Target. I didn’t giggle about wine or coffee. I wasn’t wearing t-shirts about my “tribe” or complaining about my husband being my “third child.” I was very serious about everything. I wasn’t serious in that any of that stuff would’ve offended me, it’s just that I wasn’t in a position where those kind of things were relatable to me. At that point in my life, I was having a crisis. I felt like my life and my family were hanging in the balance and that took away my ability to joke about them. I felt like if I complained about my family, it meant I wished they weren’t there. 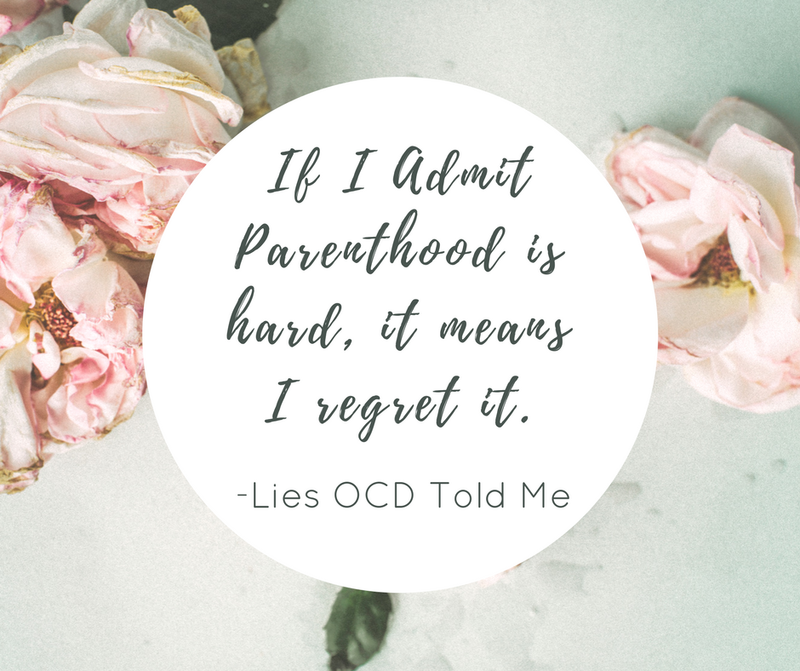 If I admitted parenthood was hard, it meant I regretted doing it. If I didn’t cry about a scary thought, it meant I agreed with it. If I didn’t feel butterflies when I told my kids I loved them, it meant I was lying. I was having an identity crisis. I didn’t understand what had happened to me. I was scared of what was going on in my brain, which in turn made me tread lightly in all areas of my life. During that time, I felt like a complete fraud. Everything I said and everything I did was empty. With one thought, I completely disregarded everything I had previously believed to be true about myself. Every kind word or action I had ever said or done was forgotten. Every dream of motherhood I had as a child must’ve been wrong. My belief that I had always been a “pretty good person” was instantly gone. I felt like in order to be able to become “me” again, I needed to “test” myself to make sure I was still the person I had always been. I would gauge every interaction with my kids no matter how small. When I cried during Easton’s vaccination shots, that proved that I loved him. If I had a bad thought about him later that day, it called my love into question. Every move I made, every thing I said was carefully analyzed. I felt so trapped in my own mind. I didn’t feel safe reaching out to anyone about my problems until I was sure that I understood them. I was willing to endure countless panic attacks and sleepless nights alone with my problems in order to try figure them out and understand them. The problem, however, with my endless need to find meaning behind the thoughts, was that there would never be an answer. I will never know why I had a thought about smothering Easton that night in July. I will never understand why my new mommy brain betrayed my heart like that. But what I do know, what is the truth, is that I didn’t need to struggle so hard alone. What I do know is that, though the actual thought cannot be explained, my reaction to it can be. That thought made me feel like Easton’s life was in danger. That thought activated my anxiety and my need to protect him at any cost. That thought put me into 24/7 “fight or flight” mode. My need to figure out OCD overshadowed every other thing in my life. I could not see beyond that single thought. I didn’t feel safe in my own brain. I feared being stuck in the body that had thoughts like that. I wish I would have understood postpartum mood disorders more before I experienced one. I wish postpartum depression or extreme psychosis were not the only ones I had ever heard of. I wish I would’ve known that a scary thought does not equal a scary action (or even wanting to commit a scary action). I wish I would have been able to open up more to those around me. I wish I would have known what kind of professionals to reach out to. I was so busy having an identity crisis that I couldn’t focus on anything else, because honestly, nothing else mattered to me at that time. All of these things, these silent struggles, are what my blog is about. I try not to post things that I think would be “triggering” or unhelpful to those who are currently struggling. I know there is some sort of happy medium between my OCD writing and my everyday self that I still need to figure out, but these are some of the reasons that I haven’t bridged those two aspects of my life successfully (yet).